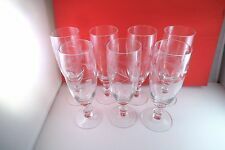 SET OF 6 ETCHED GLASS JUICE GLASSES WITH DOT / DOTS DESIGN ALL IN VERY GOOD CONDITION. CONDITION: In nice shape. One glass has a flake on the top rim. 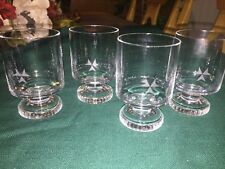 A Lovely Set of Clear Glass Juice Glasses. 4" tall x 2.5" across rim. This is a Set of 2 Juice Glasses in a beautifully etched flower and vine pattern on a multi-faceted or optic bowl. Each Glass stands 4 7/8" tall. wt.-1# 4.2 oz. 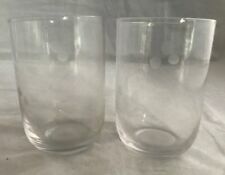 Noritake Sasaki Etched Bamboo Crystal Glass Small Juice Set of 2 NICE These are lovely glasses. They are very delicate. The glass is thin. They hold 6 oz. They all have a wonderful crystal ring, and show little if any usage. Just too much breakage doing that. I have had too much breakage doing that. I do believe it is made by Sasaki. 5-1/2"Tall Clear Crystal Footed Juice Glass. Very pretty and I hard to find! Lausitzer Krystal Grape Leaf Tall Glass. 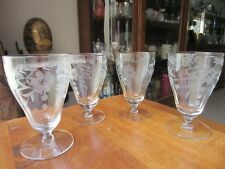 Very nice crystal glass with etched grape & leaves going around the glass. Excellent condition. with original sticker.